In a world currently filled with long, rainy spring days and ominous puffs of steel grey clouds, what could possibly be better than cuddling in with your pets, hanging out in your favorite chair, opening the window wide to the sound of pinging rain drops, and exploring the quirky, morbid world of creepy short stories? Back in the days before college when I was a teen indulging in languid summer days (and way too close to the local Barnes and Noble) I discovered an entire series of horror short story collections chosen by Al Sarrantonio and Martin H. Greenberg each with the theme of “100” alliterative little short stories. My first was the Creepy Little Creatures collection, which introduced me into an addictive world of fast paced horror fiction. Intent on once again exploring Sarrantonio’s wide ranging selection of everything ranging from classic to modern criminal gore, I picked up 100 Hair Raising Little Horror Stories to indulge myself in next. Well, ok, I actually might have bought most of the series. . . 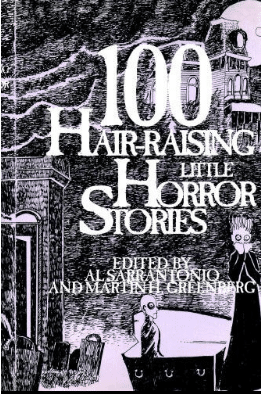 Hair Raising Little Horror Stories wasn’t quite as stellar as Creepy Creatures, which contains some of my favorite short stories to date. The Hair Raising collection explores a wide variation of theme and style, latching onto secret nightmares and wild midnight fantasies but ultimately leading to ho-hum, predictable stories many of which are forgettable. Authors range from classics such as Stephen Crane, Charles Dickens, Washington Irving, Edgar Allan Poe, Nathanial Hawthorn, and H.P Lovecraft to such modern voices as Chet Williamson, Richard Layman, Ambrose Bierce, and more. Stories range from ironic to bizzaro to psychological horror to childhood fears to legends to . . . well, you get the idea. Some offerings are exquisite and others, including the initial first several stories by Washington Irving are silly and whimsical. Most of the stories are transient, flickering past like a movie, entertaining and capturing in parts, but not really embedding themselves in our darkest psyches. Out of the collected 100, only ten truly moved me and remained memorable, making the collection worthwhile (to me anyway – mostly because I am an exceptionally fast reader) but hardly stellar. The first three “The Adventure Of” stories by Washington Irving, famous author of all things Sleepy Hollow are surprisingly disappointing, intermixing whimsy and comical horror with sloppy plotting devices and what feels like a rushed writing job. While the author is the tops, these stories hardly highlight his talent and are a dubious introduction, best skipped, to this collection. I admit that after the first two I was thinking of plowing into another short story collection instead. However, knowing that any collection of short stories has a certain propensity toward the “hit and miss” aura, I kept going. My first favorite story was the fourth in the collection, “Ants” by Chet Williamson. An aggravated man with a particular desire to destroy all ants is confronted by his own violence, plotted against by the insects he hates most. An ironic horror story, “Ants” plays on the inherently visceral fear of insect swarms and the retribution of nature. Following along in the wake of this story, “Boxes” by Al Sarrantonio combines old school storytelling with an enigmatic theme of an eccentric man and his compelling collection of ornate and ordinary boxes and the secrets they contain. “Dark Wings” is the lyrical story of an artist who becomes mesmerized by the sighting of a large, dark bird. Her paintings cannot actually capture the fear and majesty this sighting granted her, and in following her artistic dream she steps into an unreal and tragic reality. Edgar Allan Poe delights and terrifies with two of his classics. In “Berenice” a young man’s obsession with a woman’s teeth leads to an act of atrocity and desecration. In “The Facts in the Case of M. Valdemar” Poe’s protagonist seeks to understand the apex of death through hypnotism and gets more than he bargained for. “Nightshapes” follows the madness of a man married to a woman who transforms into a ravenous beast at the full moon and his one poignant and endless desire. “The Rag Thing” by David A. Wolheim (as David Grinnel) is a bizzaro/horror story depicting the actions of a rag which, left in a boarding house where the proprietress never cleans, evolves a strange life of its own and the desire to kill. “The Statement of Randolph Carter” is classic Lovecraft with a surrealistic/psychedelic nature as two practitioners of dark arts seek to discover the beauty in darkness and hidden things only for some longed for grave robbing to go terribly wrong. “Topsy” follows the misadventures of a grossly overweight man who’s delusions feed his insatiable hunger and the lengths he will go to for a snack. And finally, “We Have Always Lived in the Forest” is a disturbing tale of mental imbalance, cannibalism, and mud children. 100 Hair Raising Little Horror stories provides these ten dark gems (which I gave you the slightest taste of above) and then follows with 90 so-so stories that range from ok to uninspired. If you’re curious to view what stories you can indulge in between the old-school covers of this tome, check out the wikia list and then head over to Amazon where you can find a cheap used copy. I recommend skimming the collection and picking and choosing instead of my cover-to-cover read.